Over the course of the next week, a cohort of student leaders, chaplains and staff from Hendricks Chapel will attend the largest interfaith conference in the world, the Parliament of the World’s Religions. The parliament includes representation from dozens of religious, spiritual, moral and ethical traditions. Its intent is to bring people together in the spirit of peace, education and a shared commitment to diversity and inclusion. This year’s parliament runs from Nov. 1-7 in Toronto, Canada, presenting an opportunity Hendricks Chapel has embraced. 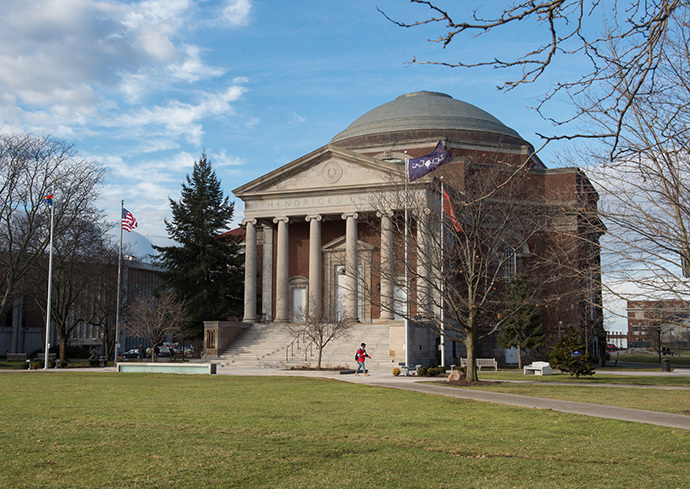 The 13 delegates from Hendricks Chapel, who represent a diverse group of religious and spiritual practices, are committed to bringing a deeper understanding of interfaith cooperation back to Syracuse University. “Where else can one find all the world’s religions coexisting in one space, having vital conversations as to how we can honor each other’s humanity,” says Rhonda Chester, the United Methodist Ecumenical chaplain. Chester attended the parliament in 2015. She describes it as a transformative experience. During a forum on women’s empowerment, Chester met a daughter of Malcolm X and took the opportunity to get up onstage to deliver an impromptu blessing. Apart from the official, Chester says she looks forward to the unexpected interactions and opportunities, and knows that the experience in Toronto will be educational and profound. Most of the cohort from Hendricks Chapel will be experiencing the parliament for the first time. For Jikyo Bonnie Shoultz, a Buddhist co-chaplain, and Junjie Ren, the vice president of the Student Buddhists Association, this will be a special opportunity to connect with a part of Buddhist history. At the very first conference in 1893, a Buddhist master from Asia was invited to speak about Buddhism to a North American audience for the first time. Shoultz says that many practitioners of Zen Buddhism in North America can trace the lineage of their masters back to those who attended this first parliament. Shoultz says she is excited to connect to this aspect of her tradition and to explore all of the opportunities for interfaith collaboration that will happen at the conference. For Ren, a junior geography major, the conference presents an opportunity to deepen his commitment to spiritual life. He describes his beliefs as fluid and varied, and is excited to learn from a diverse group of religious and spiritual leaders. As a member of the Spiritual Life Council, an organization for student religious leaders on campus, Ren says he also hopes that he and the other students who are attending the conference can draw inspiration from their fellow student spiritual leaders. The opportunity to support and send a cohort to the parliament was, according to Hendricks Chapel Dean Brian Konkol, a direct expression of the chapel’s historic mission, vision and values. Following the Parliament, the Hendricks Chapel cohort will make a presentation to the University community in order to share what they learned and build upon efforts to foster an inclusive campus community. More information on that session will be announced at a later date. For more information, contact Hendricks Chapel at 315.443.2901 or chapel@syr.edu.